Immediately apparent is the music’s aching, late-romantic melange of Wagner, Debussy, Puccini and Alban Berg. 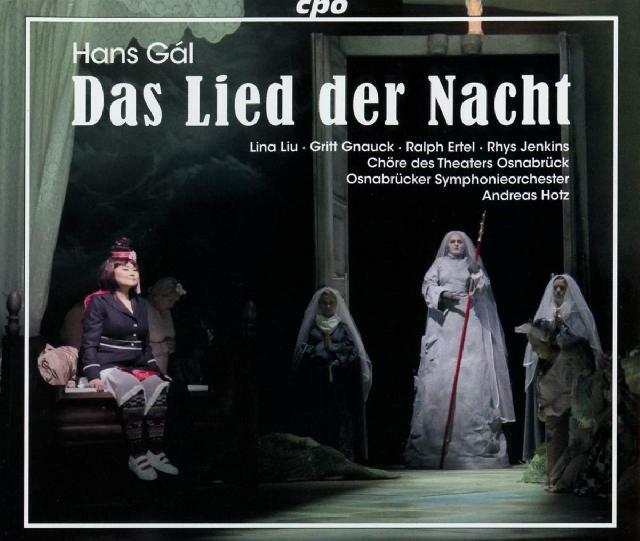 Hans Gál’s ‘dramatic ballad’ Das Lied der Nacht was premiered to glowing reviews in 1926. Banned by the Nazis, it was last staged in 1930 before falling out of sight and out of mind. This live recording comes from Theater Osnabrück’s well-received 2017 revival. Immediately apparent is the music’s aching, late-romantic melange of Wagner, Debussy, Puccini and Alban Berg. The mix sounds wholly appropriate for the mythical overtones of a tale about a 12th-century Sicilian princess struggling to avoid enforced marriage and smitten by an unseen voice heard only by night. So, too, Gál’s expressive facility for writing for the voice. He’s well served here by Lina Liu’s richly sung Princess Lianora and the light, lyrical tenor of Ralph Ertel’s Nameless Singer. Susann Vent-Wunderlich shines as Lianora’s companion Hämone, and Gritt Gnauck’s Princess-Abbess, Rhys Jenkins’ Tancred and Oliver Weidinger’s Chancellor all contribute committed performances. Strong support from the Osnabrück Symphony under Andreas Hotz’s baton makes a persuasive case for an engaging, evocative piece.